615 Ten Pounds Kentfield. B366. HE20 000001. An attractive number one note. UNC. 2326 ERROR Ten Pounds Kentfield. B366 (2) Errors. E19 775225 and E36 775225. Both with serial numbers upside down. Very scarce. Both UNC. 2328 ERROR Ten Pounds Kentfield. B366. 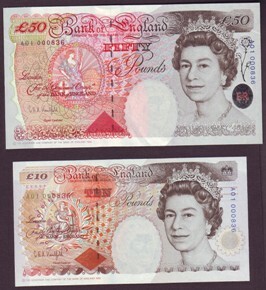 Missing most of colour on reverse. Nice error. UNC. 2327 ERROR Ten Pounds Kentfield. B366 (6) Errors. Inaccurately cut, plus five additional error notes. Average VF.